Long before we beheld Evangeline's velvety chocolate eyes or hugged her close, before we even had a referral (! 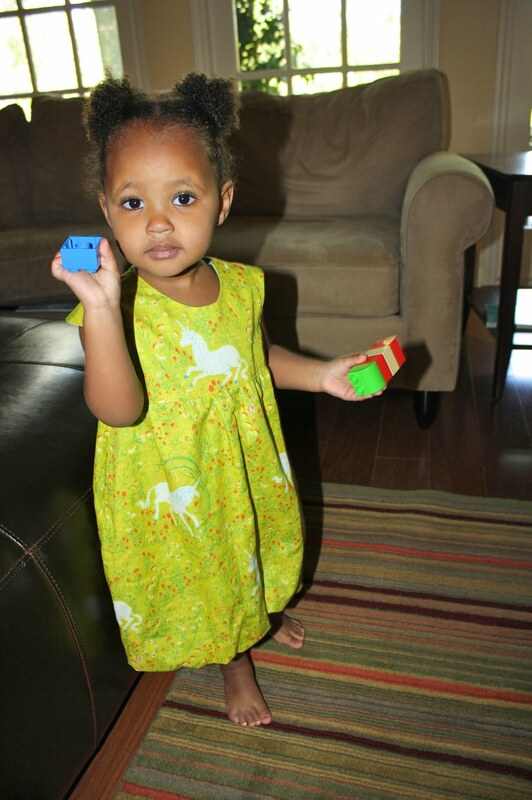 ), I had a vision of our Ethiopian beauty in a mama made dress. 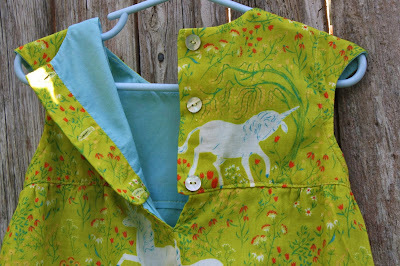 I fell in love with Heather Ross' Far, Far Away collection and bought a yard of her unicorn fabric. I knew I would someday make a bubble dress for our daughter who we then only dreamed of. There were times during the adoption process that our adoption felt like just that - a dream. When we waited and waited for a court date. When Immigration messed up our paperwork and we traveled on only a prayer of bringing her home. There were times when doubts crept in and I wondered - Is this ever really going to happen? Having this fabric tucked away, not to be used until Evangeline was home, reminded me that in my heart I knew I would one day sew a dress for her. Indeed she came home and now it's hard to imagine life without her. Still, the fabric sat waiting to be sewn into a dress for Evie. 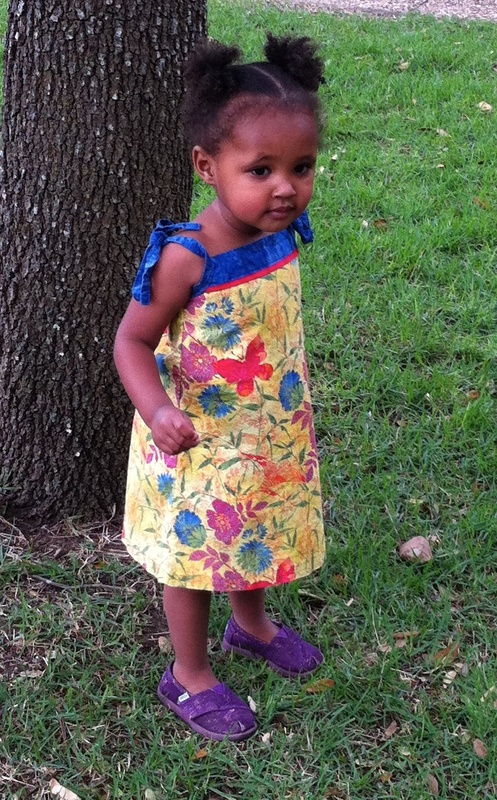 The pattern I had and was intent on using started at size 2T. Evie's on the small side. Finally this February I decided she just might fit into it. So I made it. And it was too big. At long last, she was able to wear the dress for the first time last weekend. I made both of my girls' bubble dresses only a couple of weeks apart. I made Evie's dress first, at the beginning of my pregnancy before my "morning" sickness had really kicked in. I am so thankful for that decision now. I felt so much more nauseous when I made Indigo's, only a few short weeks later. To this day, I can hardly look at Indigo's bubble dress without feeling queasy. In contrast, seeing E in this dress makes me very, very happy. It reminds me of the hope that we once had that she would someday be with us. A hope fulfilled. I lined the dress with Anna Maria's voile. This pattern is meant to be sewn with lighter fabrics. It's a great recommendation. The voile and double gauze make for a light, airy summer dress and worked well with this pattern. I wouldn't do it any other way. I think the colors are fantastic on her! Lovely dresses. I especially like the popover sundress made for your first, beautiful daughter. The colour of that dress is perfect on your second beautiful daughter! Evie looks precious--and she's getting so big! You're right--those colors look great on her! Very cute dresses!